Eternal Sunday releases a new version of the 1983 Mike Oldfield hit “Moonlight Shadow” by Canal Pop feat. Polette. The song has already been released in 2012 as the b-side of the single “Electricity”, but the artist was not happy with that version. “The version released in 2012 was not finished, we were working on it and a hard disk crashed so I had to use the only mix I had”, says Emiliano Canal, AKA Canal Pop. “Luckily enough, we were able to recover the original files and make a new version, the way I originally wanted it so sound”. 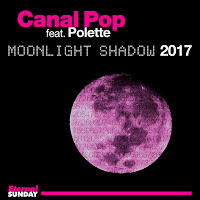 As usual, the song features the whole Canal Pop production package: carefully produced amazing female vocals and a synth-lead infectious rhythm that makes people want to dance.